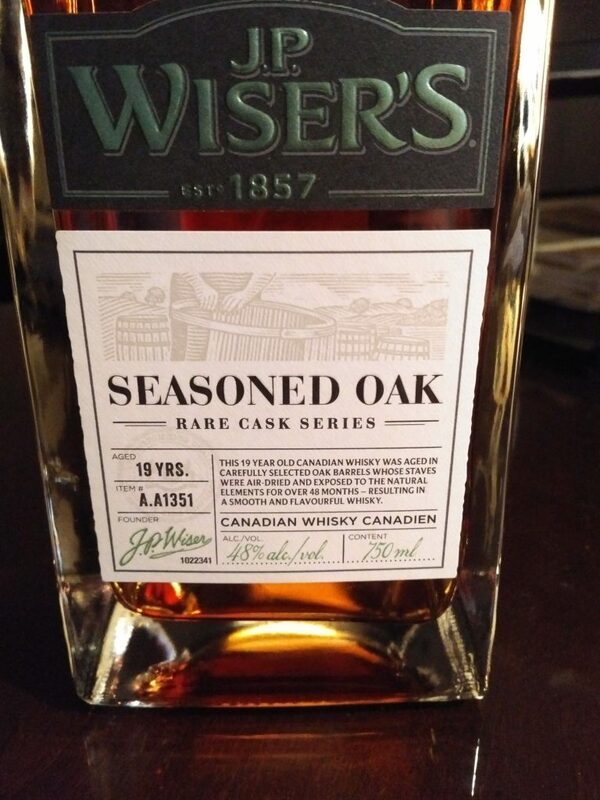 In the J.P. Wiser’s Rare Cask Series, Seasoned Oak is the latest release. It’s been on the shelves (Ontario-only) for about three months now. It is 19-years-old. For the other specs, the Toronto Whisky Society (Brian Vanderkruk) has done a good job to resume things concisely, which you can read here. The ABV is 48%, so higher than usual for Canadian whiskey. 18-year-old corn and rye whiskies were married for a further year in barrels made from staves allowed to season for four years in the open elements. In past generations such open-air drying was typical of barrel production, but the period must have varied. In an early-1900s cooperage article linked in this post of mine, it is stated, see pp. 81-82, that the mills air-dried the staves for six months and the distilleries completed the process with 15 day’s kiln-drying. Perhaps most bourbon today is aged in barrels made from kiln-dried staves that don’t receive any outdoor drying. At least, that’s my understanding from many years immersion in the U.S. bourbon scene and early visits to Kentucky. The corn spirit is Double Distilled base whisky and the rye, Star Special, a rye mash whisky distilled at a low proof in a column still and then a pot still. (The standard J.P. Wiser’s expressions are typically blends of the Double Distilled and Star, the same rye spirit not given a second run in the pot still. The pot still is more or less like the U.S. doubler-stage for bourbon or straight rye). 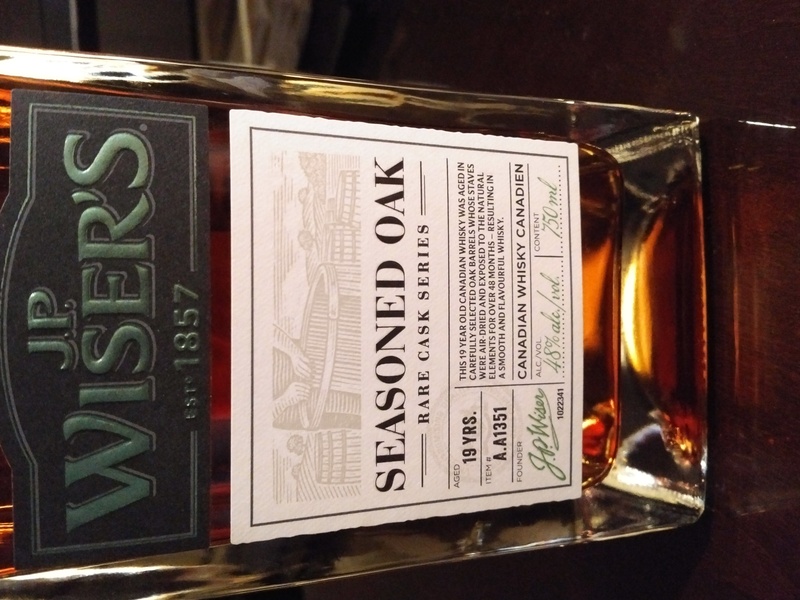 Just as for regular J.P. Wiser’s 18-years-old, barrels that formerly held bourbon or Canadian whisky are used for that aging period of Seasoned Oak. The seasoned oak phase proper is charred virgin wood, similar to bourbon barrels in the U.S. But it’s only one year out of 19, therefore, in terms of maturation. I’d guess only a little Star Special is blended into the base whisky as Seasoned Oak has mainly a grain whisky character IMO. It’s similar in this regard to J.P. Wiser’s 18-years-old. Hence the body is light and fairly clean or neutral. One review I read stated “acetone”, which can be a “distillery” or straight character, but I didn’t get that. Yet, there is a spicy cocoa top-note that must come from the extra year in naturally-seasoned virgin oak. The 20 extra dollars for the expression are paying for that, and the extra proof. Is it worth it? Some reviews are head-over-heels in love, others less so. I’m kind of in the middle. It’s interesting, I’m glad I bought it, but it’s not superlative. For me, the current Lot 40, which uses the new charred barrel, is where the action is. AFAIK it is 100% Star Special, not blended with Double Distilled, and benefits from the early and uniquely complex maturation charred new wood imparts. The best Canadian whiskies regularly available in the market today are the revamped Lot 40 and Canadian Club Chairman’s Select 100% Rye. Both are straights for all practical purposes, and the results show. For those wedded to the more traditional Canadian style, Seasoned Oak will appeal due to its age and unique character. In Greenfield, MA in 1933 The Daily Recorder-Gazette re-printed a story from another newspaper in the state, in Worcester, dealing with wild hops. With the end of National Prohibition, brewing was being revived in many states. Rural communities graced (in the eyes of some) with annual or perennial roots of the wild hop vine, took increasing notice of this resource. Most newspapers in the 1930s, as before Prohibition, mentioned hops in connection with hop markets: what were they worth, the bounty of the harvest, the different types of hops, and their harvest periods. The hops in New York State, then still a growing area, included English Cluster, Canada Red Vine, Humphrey, and, by 1935 or so, Late Cluster. Late Cluster was planted from roots imported from California and Washington. The West Coast cultivars were more resistant to disease than English Cluster. 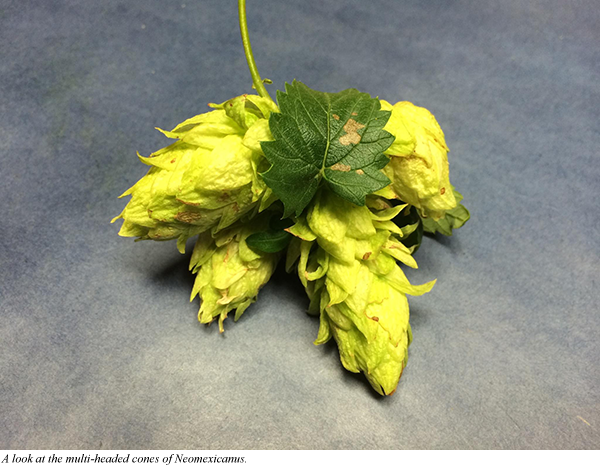 People sometimes wondered if the wild hops could make good beer. One story, from back in the 1890s in Minnesota, suggested the hops were tasteless and of no value. The journalist did aver that only a trial could really tell. The Worcester Telegram took a different approach. The writer was unusually reflective. He looked at the hop, not in the context of a revived brewing industry, but for its importance to American history and the American spirit. This type of article was quite rare in the small-town press of the 20th century. It was more common in the 1800s, when most U.S. journalists worked in small towns and cities. Revival of the ancient interest in brewing is a reminder that wild hops still grow in more or less profusion around many an old homestead of Worcester county. With perennial hardihood, they must have survived down through the years, since a time when the Colonial family was inclined to be entirely sufficient unto itself. Those wild hops stand for a period when men very largely made their own beer. People made prac­tically everything they used, in those days, buying as little as possible. A farmer—and most of our an­cestors were farmers, grew hops and barley for his beer, grapes for his wine and perhaps rye for his whiskey. He raised sheep and sheared them for wool, that his wife might make his clothing. He butchered his own cattle, eating their meat, tanning their hides for shoes for himself and harnesses for his horses. Perhaps he owned a forge and made his own scythe, hammering it out again into a sword if the need arose. A rather pleasant picture, all this, of the family finding all its provender, even its amusements. But there were crop failures in those days, too. The farmers were not always completely self-sustaining. The hops have come down through centuries to remind us of the independence that used to be so American, but also they remind us of the dangers that went with the simple life of that simple day. One of the wild hops of America is Neomexicanus. The pioneering craft brewery, Sierra Nevada, has used it in brewing. I tasted the beer which was superb, and not gamy or weird in any way. 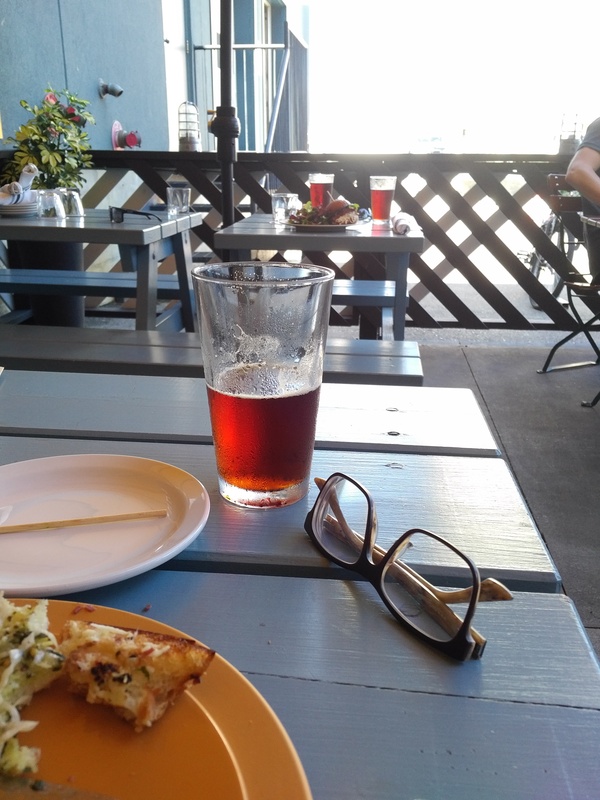 The hop in question is pictured above, and the beer, below. (Source for both: Sierra Nevada’s website). The uncredited author of the Worcester Telegram story would have been proud. Note re images: The two images above are from the website of Sierra Nevada Brewing as linked in the text. The quotation is from the Fulton History newspaper archive, also as linked in the text. All intellectual property therein belongs solely to the lawful owners, as applicable. Material is used for educational and historical purposes. All feedback welcomed. Lapidary reviews, couple of lines or so. Paragraph-long, adjective-laden cogitations are still valid – I cut my teeth on the best of them. As I get on though brevity rules. Czech lager, very fresh at LCBO currently, a classic Pilsen-style. Shade lighter than Urquell but just about as good. Rich malt, clean flavory hops. 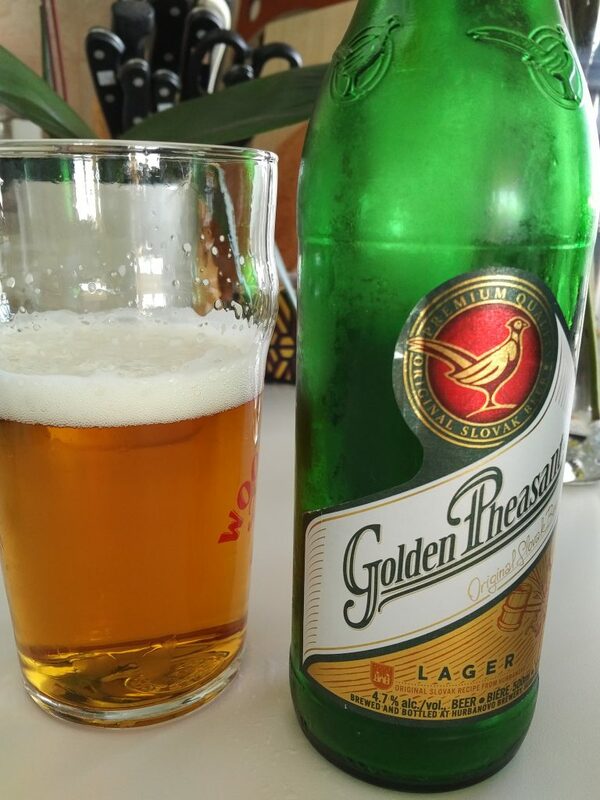 It spells the uniqueness of Czech lager. 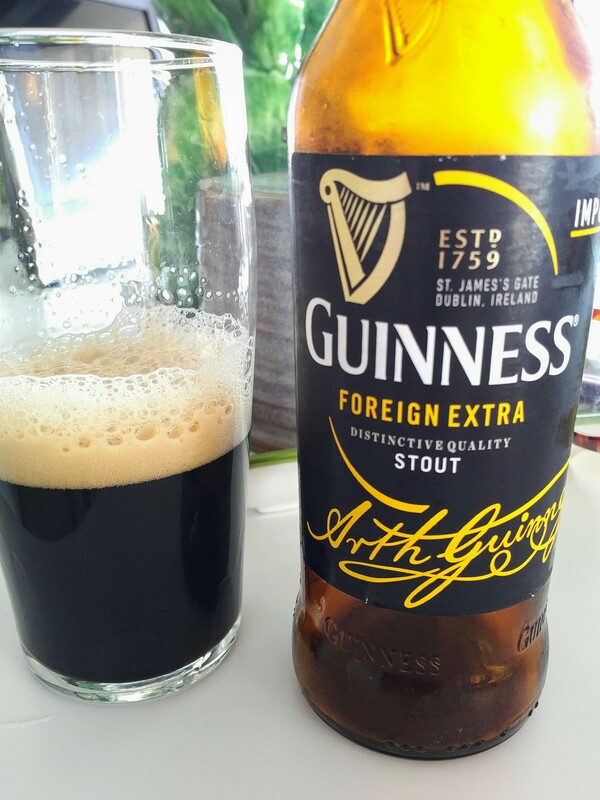 Better than ever, woodsy, slightly smoky, a touch lactic, winy, malty: so different from standard Guinness. Inexplicably not available in Ontario. I had to try this despite, or maybe because of, the fever raised about a brew people on a budget can afford. It’s all-malt, good European hops, a Helles. Similar to many German or craft examples, just lighter. If you don’t believe me, believe LCBO’s notes. A reddish ale, mainstay of Henderson Brewing in Toronto. Caramel-malt driven, good underpinning of hops but not “hoppy”. 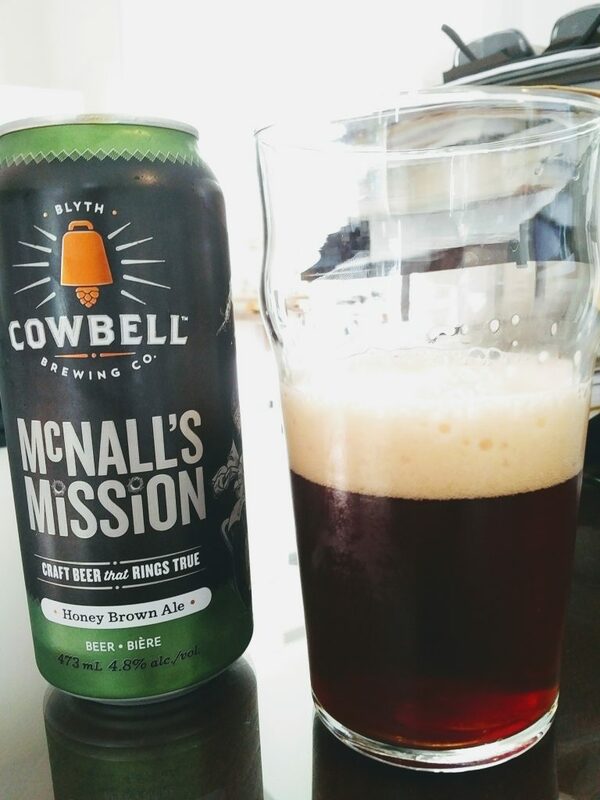 A great beer with food, its forte, IMO. Excellent with the brisket sandwich at Drake Commissary next to the brewery. An export 5% ABV, very fresh from LCBO again, but not that interesting. Adjunct brew? Palate seems to show it. Decent, but not more. 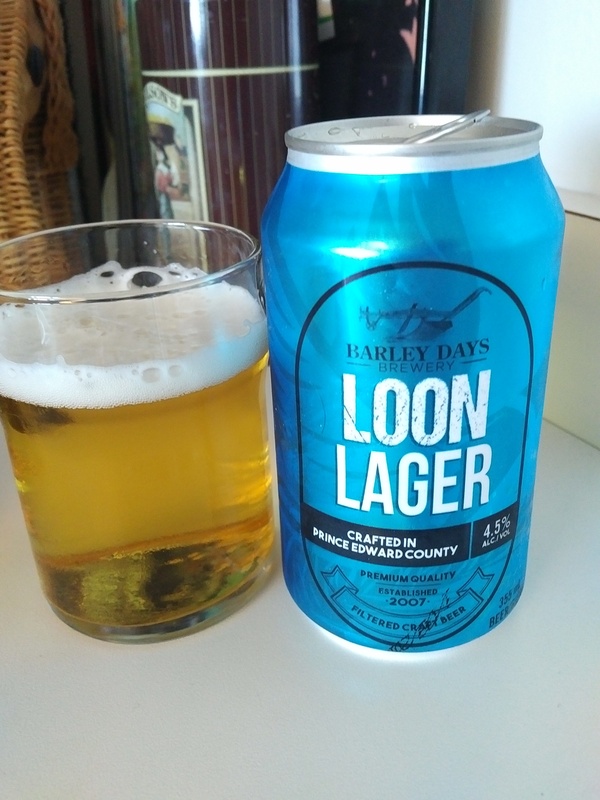 A gold medal winner at the recent Ontario Brewing Association awards. 5.5% ABV, from Uxbridge, ON. Brewed by industry veteran Doug Warren. Tasty, not too dry, faultless. I hope an “export” version will emerge over winter: deeper in extract and hopping. 6.1% ABV. Sampled at LCBO. Interesting brew, good fruit, not sugary. Yeast background “different” but mild. Farmhouse without the spicy/clove of Belgian-yeasted beer. Lots of flavour, grainy, like multi-grain dark bread. Local raw honey in the fermentation. No mead-like aftertaste though, all to the good. Reminds me of Black Oak Brown Ale but with a floral twist, and a touch sweeter. Lot 40 is a Canadian whisky marketed by Corby and made at the historic Hiram Walker plant in Windsor, ON. Until purchasing the current bottling (pictured), the last one I bought was the 12-year-old cask strength that came out about a year ago. That whisky had a good full character but was not dissimilar to the main bottling which, since inception about 20 years ago, had a marked “distillery” character. This meant a congeneric or chemical-like note, some people would say doughy or orangey. It’s noticeable in some young craft distillery whisky, too. The current bottling has altered the profile, a welcome change in our view. But first some background. In a detailed review of Lot 40 in 2015, I wrote that I drank a dram or two and used the remainder in my own blending experiments. The character “neat” was too unrefined for me, although clearly many people liked it. Lot 40 had been off and on the market in Ontario since about 1998. A “2012” version, issued that year, didn’t vary much from the earlier version, maybe a bit richer. From information given on my personal tour of Hiram Walker a couple of years ago, and from Internet sources, Lot 40 is distilled at a traditional, straight whisky proof (below 80% ABV certainly). A column still distillate is run through a large pot still, so it’s a two-step distillation process. The mash was originally 90% unmalted rye and 10% malted rye, a formulation common in the 19th-century based on my own research many years ago. However, for some years, the malted rye is dispensed with. Enzymatic preparations are used to ensure the conversion of starches to fermentable sugar. The process is familiar to me from brewing knowledge, as well. The reason is malted rye can bring in unwanted microflora, bacteria and fungal activity, that can adversely affect flavour or consistency. So now, Lot 40 is 100% unmalted rye, but is also aged in new charred oak, wood similar to that used for bourbon or U.S. straight rye. The current green label calls it “virgin oak”, and the former bottlings did not use this term. 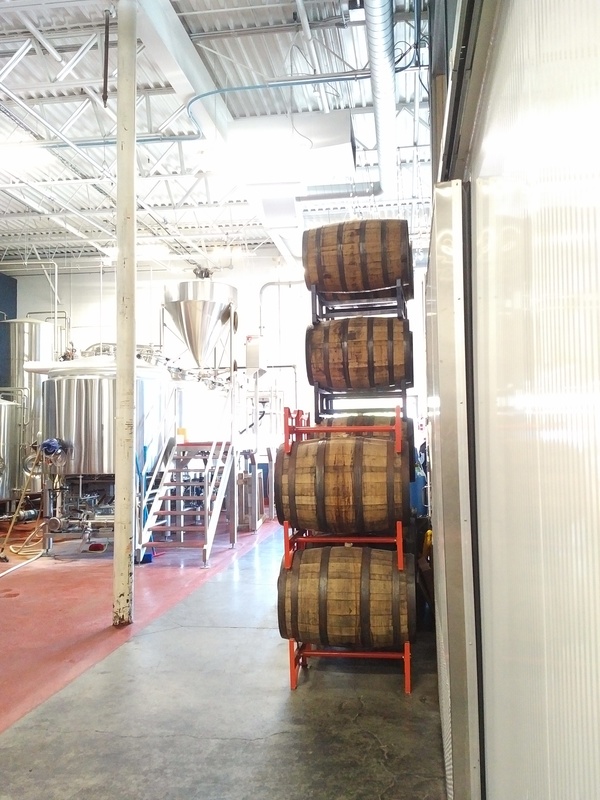 Earlier, re-used bourbon barrels were likely used in quantity, at least for part of the maturation. They are the same type used to mature both Scotch whisky and the high proof, grain (base) whisky that forms the basis of most Canadian blends. The “green label” has been on the market for about a year now and I caught up with it recently. The legend on the tan box no longer names Michael Booth, a retired Hiram Walker distiller. Clearly the whisky has evolved since his time. In a nutshell, this is the best Lot 40 available to date. The congeners are toned down, the whisky is sweeter and rounder, and is more a traditional, straight spirit. Yet it is still quite different to Kentucky straight rye whiskey, and different again to Canadian Club’s own green label, Chairman’s Select 100% Rye made at Alberta Distillers. (Chairman’s Select is bottled under the historic CC name long-associated with the Hiram Walker plant, but label and distillery are now separately owned. Hence sourcing this particular version of CC from Alberta). The main factor in the new and improved Lot 40 is, IMO, the new-charred oak. The charred interior and “red layer” mature the whisky in a way no re-used bourbon barrel can. At least this is so within a period, say, of three to eight years, the typical window to release a straight whisky. Chairman’s Select 100% Rye has always been aged in all-new charred barrels. This “catch up” for Corby’s own flagship straight whisky can only be commended and the quality shows. Here is the link to Corby’s website for the current Lot 40. In 2006 memories of “Taylor’s mutton pies” in Paterson, NJ were the focus of a Roadfood forum discussion. The Taylor Bakery had long closed by then, as the principal sold the pie recipe in 1990 to another bakery, Ashton. Ashton continued making mutton pies but the business ended a few years later due to fire. Taylor-Ashton was not a one-off. Numerous bakeries in Paterson and other northern NJ towns made mutton pies and other British foods. The demand in part came from cultural centres called “Scotch lodges”. There was also extensive home baking of the specialty. Fond reminiscences were recorded in Roadfood, with tips on how to find similar pies in the area. Even in 2018 you can find them, say at Stewart’s Scottish Market in Kearney, NJ. The store was originally called Stewart’s Market. We infer that earlier its British character was simply taken for granted. Kearney is only 13 miles south of Paterson. The images below are from the Stewart Scottish Market website. My grandfather loved Taylor’s meat pies. A couple of years ago we found the closest thing to them in Kearny, NJ. There are a couple of places, one is Stewart’s of Kearny, and they have a website http://www.stewartsofkearny.com/ where you can order on line, however, I suggest taking the ride to Kearny. I have lived in and around Paterson all my life and grew up on Taylor’s mutton pies. My great grandfather had a blacksmith shop at the bottom of the Great Falls, and his grandfather moved there when “God save the King” was still the national anthem. By the 40’s Taylor’s pies were everywhere, deli’s, roadhouses (ginmills or bars), the corner store and not only in Paterson but all the surrounding towns. I grew up on all types of British foods, Oxtail soup, kippers and eggs, fish + chips, etc. but Mutton pies were my favorite. We would cut them down the middle so that the meat was facing up and watch them rock back and forth taken from a very hot oven, I can still smell them. Mutton pie was and is a regional taste in the north of the state. Food arbiters intone that popular American taste is anchored in packaged supermarket food, ice cream, soft drinks, extra-light beer, and food-chain fare. Yet, many old-established regional tastes endure, and are appreciated. One thing mutton isn’t is tasteless. Still, mutton pie in America? True, Owensboro, KY mutton is a noted specialty but the Kentuckians douse it in a spicy BBQ sauce. In New Jersey, the vigorous sheep food was eaten pretty much unadorned except for its flaky pastry enveloping. So I was thinking of mutton pie in Paterson. And then I remembered my essays on India Pale Ale and English-style brewing in that very city circa 1916. It all connected. 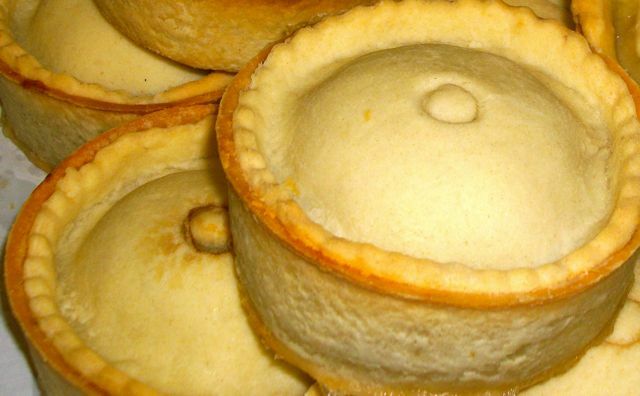 A pot of ale and mutton pie sound like fast friends, and they were in the U.K. in the 1800s. They still are, although lamb and mutton are often replaced by game, poultry, or another meat. I saw many variations – even vegan – at a pie counter at the Great British Beer Festival in London last month. But ale and porter, even before Prohibition, were not all that common in America. German-style lager had conquered most areas, including New York and environs. Of course, some ale breweries, mostly established in the 1800s, continued until Prohibition (1920). But why ale in Paterson? It was a busy place then due to its textile, firearm, and other industries but hardly an international centre like Manhattan. It was not a haunt for British business, arts, or diplomatic figures. You can know the answer, or a good part of it, by reading this 1904 article, “Like a Corner of Old England”, published in the New York Sun. There was a substantial English colony in various districts around Paterson, it arrived mid-1800s to produce silk and other textiles, initially by hand-loom. Later the weavers worked in textile factories powered by the high falls on the Passaic river. These districts retained their English character for many decades. Do they still today? Readers familiar with the area can tell me. What better core of loyal followers for the pale ale of Indian romance than this group of English and Scottish settlers and descendants? The 1904 story mentions many English foods brought by the incomers. Some are recited in the Roadfood discussion – 100 years later – not excluding mutton pies. The article also muses on the English-style pubs that naturally implanted in the area. The journalist writes that the bucolic English atmosphere evoked by the pubs is something you “wouldn’t dream of finding within 100 miles of the uproar of New York”. Yet to his surprise it existed in Paterson and other British enclaves in New Jersey. The writer was too savvy not too know the similar origins of many old-stock Americans. But he explains that English influences had waned since the first settlers arrived. Hence the unusual foreign character displayed by Paterson’s more recent Weavertown and similar pockets. The pubs, too, must have stood out from the American saloon. Saloons were rarely praised publicly then, even in cosmopolitan New York. Consider this image of pre-Prohibition ale drinking in New Jersey (source noted below). The locale was Harrison, east of Manhattan again and another town in upstate New Jersey. You can see the big glasses used to hold a darkish beer, probably Ballantine India Pale Ale, whose advertisement is tacked on the wall. It’s a safe assumption that cataracts of ale and porter similar to the drinks above helped mutton pie galore slide down in Paterson. Mutton pie and British-style IPA – that was America, one culinary corner of it, then. But the pies survive in northern New Jersey, and the IPA is back although probably not tasting like it did in 1916 due to the modern hops. There must be a craft beer scene in or around Paterson today. Its movers and shakers should give the local bakers a call who still make the old foods and do a pre-Prohibition picnic or supper. The beers are back to pair with them, more or less. And the old foods never went away. 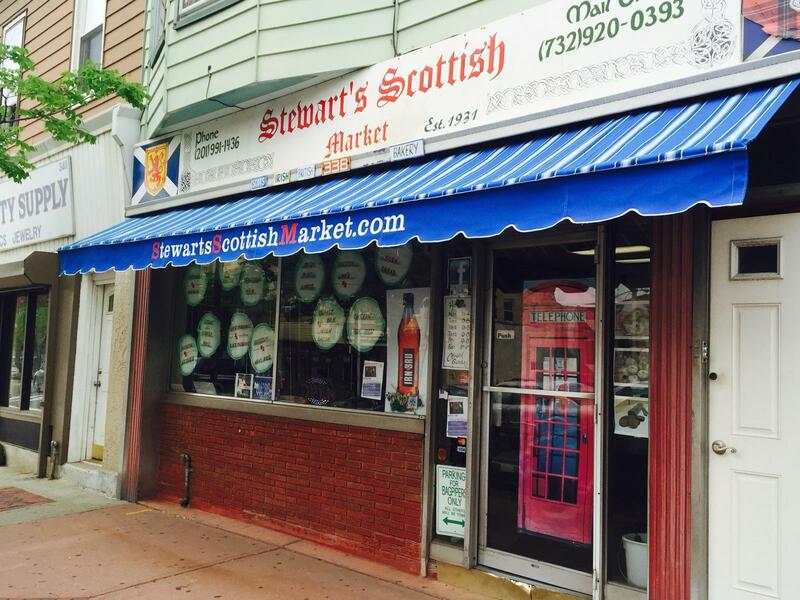 Note re images: The first two images are from the website of Stewart’s Scottish Market in Keaney, NJ, as linked in the text. The third is from the historical website www.nj.com, from the New Jersey Historical Society. All intellectual property in the images belongs solely to the lawful owners, as applicable. Images used for educational and historical purposes. All feedback welcomed. *I find the foreign or unfamiliar alluring too, but long-established local tradition, terroir if you will, can reveal mystery and interest no less real. Back in 2005, 13 years ago that is, the magazine All About Beer ran a column in which beer writers were asked to name their favourite beer authors. Those mentioned included Michael Jackson, Roger Protz, Tim Webb, Fred Eckhardt, Allen Sneath, and Charlie Papazian. Older writers also came in for mention including Wahl and Henius (co-authors), Tizard, Arnold, Salem, and old beer journal series. (Beer historical studies is not new. Many were familiar with historical writing long before the current generation of historians). Specific brewery histories were named, Pabst’s was one. Some mentioned modern technical works on brewing, Garrett Oliver cited numerous of these including Briggs’ well-known text. There’s another book called Let There Be Beer by Bob Brown (1932) I came upon not too long ago, which contains, I believe, some of the most lyrical writing on beer I’ve ever read. Really wonderful. Of the 15 interviewed he was the only one to mention Bob Brown. Checking online, but based also on my memory going back to the 1970s, I’ve discovered that Brown’s book to all practical purposes is a dead letter to modern beer writing. It’s cited briefly by perhaps a half-dozen writers I’ve been able to locate. These include, I’m happy to state, Scotland-based blogger Rob Sterowksi whom I know on Twitter and from his excellent blog, here. Brown also wrote a book on cheese that Rob mentions appreciatively, and in that context he made a similar, complimentary reference to the beer book. Who was Bob Brown? What kind of book did he write? Why does virtually no one (in beer) know who he is? Illinois-born Bob Brown had the distinction, not just of writing of a fine book about beer that needs re-introduction, but also a series of respected books on food, co-authored in this case with his wife Rose and/or his mother Cora. The “Browns” are well-known in culinary historical literature, in fact. The clan certainly would have been familiar to Julia Child, James Beard, Craig Clairborne, and other pre-1970s American food luminaries. Not only that, Bob Brown was an internationally-known poet, fiction and non-fiction writer, and publisher. He is remembered to this day for both realistic and experimental writing, essay work, and his c.1930 “reading machine”, a kind of progenitor to Amazon’s Kindle and other e-reading devices. In fact, Brown has been subject of a 2016 biography by Dr. Craig Saper, The Amazing Adventures of Bob Brown: a Real Life Zelig who Wrote his way Through the 20th Century. Saper, a Maryland-based professor of language and literature, does not fail to mention the beer book of course. But Saper is not a beer historian and his insights, while valuable from a media and biographical standpoint, do not venture into this other territory. There are one or two shorter, recent academic treatments of Brown’s literary work but nothing extended, to my knowledge again, by a beer writer. Robert ‘Bob’ Carlton Brown, II (June 14, 1886 – August 7, 1959) was an American writer and publisher in many forms from comic squibs to magazine fiction to advertising to avant-garde poetry to business news to cookbooks to political tracts to novelized memoirs to parodies and much more. In the first two decades of the twentieth century, Brown was a bestselling fiction writer and found great commercial success selling his stories to magazines and with his novelizations of those serialized magazines stories collected as What Happened to Mary? (1913) and The Remarkable Adventures of Christopher Poe (1913). He also published bohemian poetry when he and his second wife, Rose, became central figures in Greenwich Village’s bohemian arts and culture scene. As part of his work with The Masses, Brown also became a fund-raising impresario staging balls and costume parties at Webster Hall. With the start of World War I, the Browns were forced into exile, first to Mexico for a year with other war resisters called Slackers. Later they eventually made their way to Brazil where they started an international business news publishing empire. Using the profits from their business, they traveled around the world in the mid-1920s, spending about a year in China. In 1928, they located to Europe to join the expatriate avant-garde group in France, which included Gertrude Stein, Kay Boyle, and Nancy Cunard. They entertained cultural figures from Emma Goldman to Charlie Chaplin. Brown founded Roving Eye Press, a press dedicated to publishing mostly his own experimental writings. His most famous works at this time include his manifestos and experimental demonstrations, including in The Readies (1930) and Words (1931), for his reading machine and the processed texts that would revolutionize reading. With the economic depression in the 1930s, the Browns, including Cora, Rose, and Bob, eventually moved back to the United States writing bestselling cookbooks to make a living . They wrote over twenty cookbooks, such as Cooking with Wine (1934), 10,000 Snacks (1934), and The Complete Book of Cheese (1955). The Browns simultaneously worked on a commune, and joined the faculty at the radical Commonwealth College; Bob also helped start the Writer’s Guild and organized summer writing trips to the Soviet Union. In the 1940s, after Cora died, Bob and Rose became writers in Hollywood; they wrote numerous story treatments for the movie industry, and used advances and fees to fund travel to the Amazon. They published a colorful memoir about their travels and collected artifacts, which they later donated to museums in Brazil and the United States (in Los Angeles). They eventually moved back to Brazil in the mid-1940s, and Rose published a few young adult history books. In the mid-1950s, Bob moved back to the United States after Rose died. He married his old friend Eleanor, and they restarted Roving Eye Press as well as publishing cookbooks, selling rare and unusual books, and publishing works with the Beat poets. For more information on Brown see this blogpost by K.A. Wisniewski, also a Maryland-based academic. He is part of a group with Saper who have re-established Brown’s Roving Eye Press. It shows a headshot of Brown, as well. 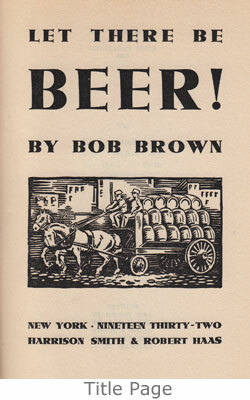 For an outline of Let There Be Beer!, see Brown’s entry in the website Beer Books, here. It sets out the table of contents and includes a brief extract. The site tags the book, quite accurately, as “rare”. 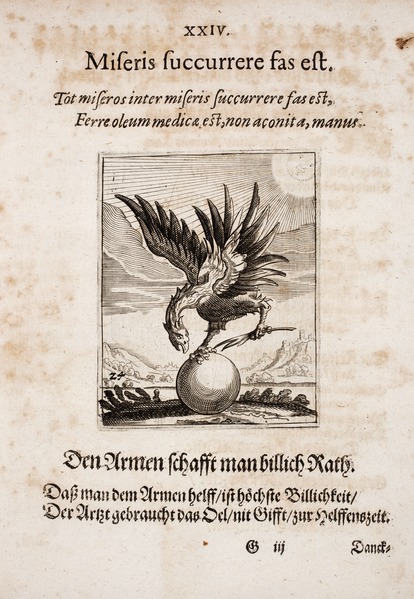 (The title page shown above is from that entry). The book shows on every page the high literary skills of the writer but also his deep knowledge and appreciation of beer, its history and ethos (mainly in America, Germany, and Britain). The subject is treated in an idiosyncratic way, to be sure, but one is always enlightened and usually entertained. 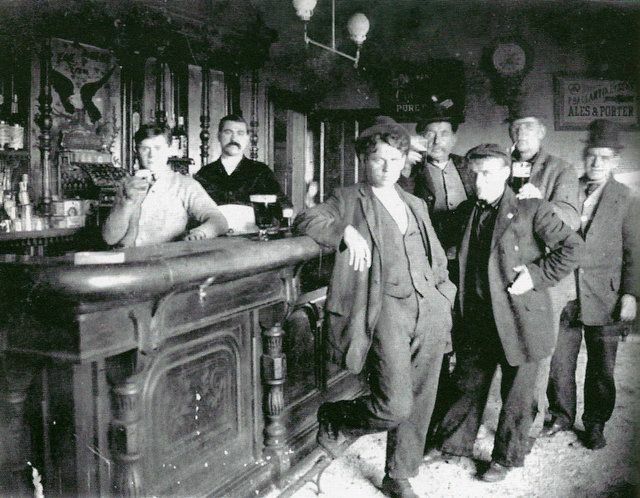 Brown’s youthful experiences with beer are among the best parts, New York saloon days as well. We especially like his evocation of the pre-Prohibtion drug store, which functioned as a quasi-saloon in many dry areas. Brown was an odd-type, an artist through and through, rather left-wing (which we are not), but wise in the ways of the world including the business world when it suited him. The book features in many chapters (not all) an unusual style, at times tending to the ironic and even fabulist. We think this was intended, first simply as humour, second as a kind of parody of the Prohibition mentality, or riposte to it. Why isn’t the book on the lips of every modern beer scribe or beer historian? Because it came out a long time ago, during Prohibition albeit with its end in sight, because America was in Depression, because the world was much larger. Another factor is that Germany was soon to enter its darkest period, of Nazi rule. Few were going to lyricize and perpetuate a book that rhapsodized German brewing history and customs. When beer was legalized in 1933, an event foreseen in a concluding chapter in the book, beer had its own ideas of what the public wanted, or was going to get in any case. Much of the pre-Prohibition lore lovingly recalled by Brown went by the wayside. An avant-garde New York writer talking endlessly of German beer in a pre-Repeal book wasn’t going to change anything. In any case there was no international network such as we have since about 1970 to publicize and give legs to an effort like that. Michael Jackson’s The World Guide to Beer (1977) was the obverse case. Finally, the book is quite hard to find. It was never reprinted and is not viewable online except for the odd excerpt. I obtained a copy though, and can confirm the book is wonderful and important. In many ways it is better than anything our modern beer writers have done including Jackson, due again to Brown’s advanced writing skills but also his particular interests and topics. Summarizing my view of a plausible relationship among the Victorian English beer types H.K., A.K., and hock, it’s like this. From “Hopped and Keepable”, a term in Fuller’s mid-1800s records, we get H.K., a beer type in those records and clearly the initialism. From H.K., we get hock, by how H.K. sounds pronounced as a word, in effect an acronym. A surmise, but persuasive imo. By similar surmise, from H.K. we get A.K., either from an early misreading of hand-lettered H.K. or from dropping the h. But assume the h doesn’t drop for initialisms (the “aitch” factor). Then or in any case it comes from dropping the h in hock. “Ock” seems quite close to A.K. If an ill-lettered person scrawled “awk” or “ock”, it could come out as A.K. In these readings, since “hopped and keepable” is the root, A.K. retains the sense of keeping, which a brewer stated in 1870 means “keeping ale”. There is the added nuance of keepable too, due to the descent suggested. This helps to understand why A.K., a beer sold within a few weeks after racking, could be viewed as a pale ale (stored) type and why the k in A.K. has the sense of keeping. Let’s assume though Fuller’s 1800s hock derives from the old festival hock ale, or from a synonym for white porter borrowed from the British term for a German white wine. In either case, if H.K. and A.K. derive from that hock, then “hopped and keepable” and “ale for keeping” would be retrospective, erroneous readings. Such alternate derivations seem unlikely to us though for reasons discussed yesterday in our Part I. Of course too, maybe H.K. isn’t related to any sense of hock, and/or A.K. isn’t related to either of them. It’s possible, but doubtful in my view. AK was and is a light bitter style, sometimes confused with being a mild ale but generally accepted now as a lower gravity version of the pale ale family (around 1045-1055 OG). The 1800s was its heyday but some is still made. I recreated a 1870 recipe with Amsterdam Brewery in Toronto earlier this year. The initials AK, or A.K., have been a puzzle. I’ve uncovered the only contemporary explanation so far to appear, that it means keeping ale, as discussed last year in this post. The first appearance of AK appears to be in 1846 from Ind Coope as writers Boak and Bailey have found. See this 2014 article of beer writer Martyn Cornell on A.K. where he mentions their find and other thoughts on A.K. origin. I cannot recall reading any discussion of HK by beer historians, or finding evidence it existed myself, versus the designations AK, XK, K, KA, AKK, etc. If anyone has found a brewery ad for HK or offered a discussion on same I invite comment, certainly. I’m starting to think there is a connection between A.K., H.K., and modern hock ale. Fuller is famous in beer circles for its arched brick Hock Cellar. At pg. 256 he discusses “horkey-beer”, and likens horkey to hoch, so while he does not use the term hock ale specifically, he is linking hock ale to the hock festival tradition. Numerous other sources are to similar effect. (The addition of the “r” in this fashion is common in some English speech. “I sawr the news today, oh boy, about a lucky man who made the grade…”). But if it’s true that H.K. meant “hopped and keepable” – and Fuller should know – this provides a clue to what its hock ale meant. Try to pronounce H.K. as a word – it sounds like hock doesn’t it? Especially unlettered people might make that inference, workers at a brewery or drinkers (not the founders of Fuller, whose business dates from the 1820s. They have gentry origin). H-dropping occurs (variably) in most of the dialects of the English language in England and Welsh English, including Cockney, West Country English, West Midlands English (including Brummie), most of northern England(including Yorkshire and Lancashire), and Cardiff English. It is not generally found in Scottish English. It is also typically absent in certain regions of England, including Northumberland and East Anglia, although it is frequent in the city of Norwich. Fuller is in Chiswick, an area between Heathrow and London that seems propitious for one of the H-dropping areas, or let’s assume it was. If you pronounced H.K. in this fashion, you might render it, because it sounds, as A.K. I think it may well be that these three terms have a common origin and the country harvest drink hock ale, which is documented as much older, is not connected. It’s true that brewing onsite preceded the entry of the first John Fuller into the business, by some 300 years in fact. The term hock cellar may have been used by a previous owner(s) and been continued by the Fullers, but so too might have been the designation H.K. After all, why would you need a hock cellar for an evanescent (harvest) drink? Harvest ales were low-gravity beers meant to refresh and be taken in quantity. Would you build all that for a business lasting a month or so? You cellar hopped beer, to keep it for sale through a much larger part of the year. The St. Pancras cellars were used to store Burton pale ale, for example. This idea of keepable too answers an interrogation made by some, including Martyn Cornell, that a keeping ale sits ill with A.K. since the style wasn’t stored really, it was sent out fairly soon after fermentation. There is evidence it was stored longer than mild ale, but not much longer, nothing like the traditional storage associated with India pale ale as Cornell documented in his early writings, the stock or October tradition of IPA (his great contribution to beer scholarship IMO). But hark: if something is keepable, that implies it can be kept for some months, but can also be appreciated rather new. This is exactly what A.K. is, a bitter ale drunk fairly new but that can last longer if wanted. The nuance of keepable vs. keeping changes the whole picture, arguably. I know from my own experience AK can last a good while. I have two cans left of Amsterdam AK, brewed about seven months ago, and they drink great. They are in the fridge but were stored for about half the time in our hot spring and summer at room temperature in the room I write. The beer is not pasteurized, just centrifuged. I won’t say this is a “theory” because if you use that word some people get all a-furrow of brow and pursed of lip, you haven’t enough evidence, you see, don’t presume, etc. I’ll say it’s a working hypothesis, and I want to record it before I move on to other things. Finally, if H.K. and A.K. have the same origin, the 1870 explanation that A.K. means keeping ale is proven, via the variant keepable. The fact that Fuller made a mild version of its H.K. may explain too why at times A.K. has been typed as a mild ale. Note re image: The image of the griffin pictured is from this site and believed in the public domain. By Johann Vogel, 1649. *N.B. Another line of origin for hock ale is represented by a few early-1800s recipes under this name, such as here. It is termed there a white porter, and made like porter except no dark malts. So a kind of pale ale, hence apt for cellaring (vs. a weak harvest ale). But again: whence the name? If Fuller made white porter/pale ale early 1800s, did an acronym result from hopped and keepable, or simply how H.K. sounded as a word? Hock in the sense of strong beer goes back at least to 1771, see this dictionary source. I incline that prosaic trade terms did inspire a more fanciful, erratically used term, hock. Alternatively, maybe white porter was viewed as akin to hock (white) wine while regular porter, to red. If that is true, then, as in the case where hock ale might have the old festive origin, HK and even AK may be derivations that only retrospectively seem related to the keepable/keeping notion. However, I doubt the wine sense is behind the hock name for beer, the markets for beer and wine seem too separate due to class and price. And, as noted above and in the Comments, a distant festive origin for Fuller’s hock seems increasingly unlikely to me as well. Looking at it the other way, that the name hock derives from HK, with AK being a variant, seems more likely. This is in tune also with how the term K is used in the beer designations mentioned such as K, AKK, XK where it generally notes an ascending of strength and quality related to greater keeping. I was a Canadian judge in June for the World Beer Awards 2018. A comprehensive press release will be issued September 20 with final award results. Style and country winner results are available now, see below. Soon we will know the “world’s best” in each of nine categories, Dark, IPA, Lager, Pale Beer, etc. Over 2,300 beers were submitted, from almost 500 producers, from some 50 nations. Of course, judging was based on the beers submitted, as in any awards system. It’s a valuable barometer nonetheless, and the winners should feel great pride. All contestants should be proud, in fact. The standard of the beers I tasted was uniformly high and not everyone can win. Canada had an excellent showing in styles with e.g. Muskoka Brewery winning for Specialty IPA (Berry Springer), and Cameron’s for Hoppy Pilsener, the 12 Mile India Pale Lager. Quebec breweries gained a number of the awards including for lambic-type (Trou de Diable’s Le Hérisson Brassin Spécial), and gose (La Tuque’s La Pécheresse, Miss Ghost). Cameron’s in Oakville, Ontario won country award for Black IPA (Dark & Sticky), a fine beer of which I had bought a growler at LCBO. I can multiply examples, from Canada and beyond, but scan the lists to see for yourself. The international nature of today’s beer business is amply shown, as awards don’t typically relate to place of origin for the style. Style winner for English Style Brown Ale went to Taiwan’s Alchemist (for Chang Jung Brown Sugar), for example. For Imperial Stout, Germany took the palm (Riegele BierManufaktur for Noctus 100). Still, German breweries won for the weizen categories except dark wheat, that went to Fujizaura Heights of Japan for its Schwarz Weizen. Some things don’t change, which is nice to know too. Stay tuned for September 20. 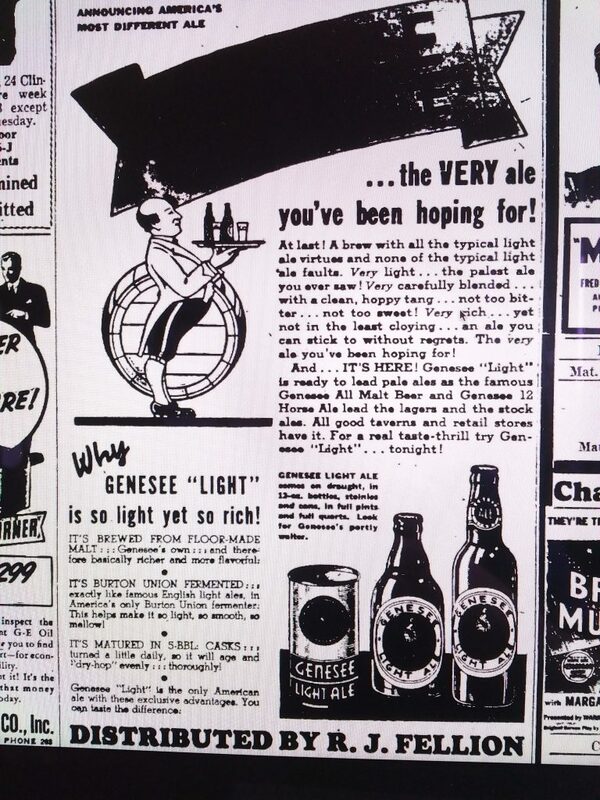 In 1938 Genesee Brewery in Rochester, NY placed a series of ads (two shown here via NYS Historic newspapers) in upstate New York for a new Genesee ale. The ads stated the beer was light in colour, fermented in America’s only Burton Union fermenter, and dry-hopped in English oak vessels. The ads implied that the cleansed beer was stored for months in large casks that were rolled, or agitated in some way, to complete maturation, a process once widespread in English breweries. [See in the Comments below an explanation of Burton Union fermentation]. Genesee touted the results as “different” but “famous”, and sure to delight area beer drinkers. Beer historians know that ales and porter were brewed in the U.S. before Prohibition by traditional methods. It is less common to see hyper-British processes used after Repeal in 1933, much less advertised to bright young things being weaned on soft drinks, fizzy lager, and Hollywood pap. It is even more unusual in the case of Rochester, NY, a city with a substantial German element where lager was well-established since the 1800s. Genesee Brewery had been bought by the energetic and canny Louis Wehle (1889-1964) upon Prohibition’s close in 1933. Wehle, then in his 40s, was a trained brewer and indeed of German ancestry. His father and other family had worked before Prohibition in Bartholomay Brewery in the city, as I discussed here. Before 1919 Wehle himself worked at Bartholomay and Genesee breweries (since 1889 consolidated in ownership), as well as the Lang brewery in Buffalo, NY. See this compact, informative career outline. Wehle became wealthy through running a home-delivery bakery during Prohibition. Sale of the bakery enabled him to take over Genesee in 1933, combining it with parts of Bartholomay. (Wehle descendants ran the brewery until 1999 when it was sold to management. Later, a Manhattan investment firm created North American Breweries to buy the business, which also owned Pyramid and Magic Hat, early craft breweries. NAB continues today, owned by Florida Ice and Farm, a Costa Rica beverage and food firm. The net: “Genny” carries on bigger and better than ever in Rochester). Why would Wehle, coming from a German-American brewing context, be interested in Burton pale ale and its processes? One can only speculate. Maybe as a professional brewer he just admired that type of beer. During the ‘zenith’ years of 1880 through 1895, Burton was the undisputed brewing capital of the Victorian age, with 32 brewing companies operating a total of 36 breweries and several independent maltsters. Bass and Allsopp continued to dominate the industry and Bass’ annual output of almost 1,000,000 barrels justifiably made it the largest brewing concern in the world. The average production of a Burton brewery (i.e. 100,000 barrels per annum) was more than double that of the London brewers, yielding a cumulative annual production valued in excess of £8.6 million (equivalent to £4.5 billion using Retail Price Index analysis to 2009). As important and controlling as German brewing ideology was in America in 1900, Burton prestige was always in the background, and reaching its peak as James explains. Possibly Wehle retained an admiration for Burton pale ale and its methods, and was intent to make this kind of beer toast of America. Indeed he brought to America from Burton, not just a full Union set, but a brewer with it, Arthur E. Vaughan. Vaughan sailed to America with his English fiancée and was married with a celebration hosted by Wehle that made the society pages. There is evidence Wehle’s newly-acquired Burton Unions was installed at Syracuse Brewery, the former Zett’s Brewery in Syracuse, NY which Wehle also controlled, in 1936. That brewery foundered in 1937 – a second failure, the first was in 1934. Either Wehle moved the Burton kit to Genesee to work some magic there, or possibly a double set was purchased from Burton and both Genesee and Syracuse Breweries used the processes under direction of Vaughan. I’ll document the Syracuse connection soon, as well as Wehle’s reliance on Francis Moritz, a British brewing scientist, for advice on making English pale ale in Franklin Roosevelt’s America. Since Genesee grew from strength to strength from the 1930s until today, Wehle’s persistence with authentic ale methods can only be commended. At the same time, I doubt the Burton Unions were still in use after WW II. Genesee’s post-WW II ads I’ve been able to review don’t mention them. Since the early 1970s when I first drank Genesee ales, they are rather light and lager-like, even beers impressively named such as 12 Horse Ale. (Of course today the Genesee Brewhouse, a pilot brewery built a few years ago, makes some interesting beers that have a fuller flavour). 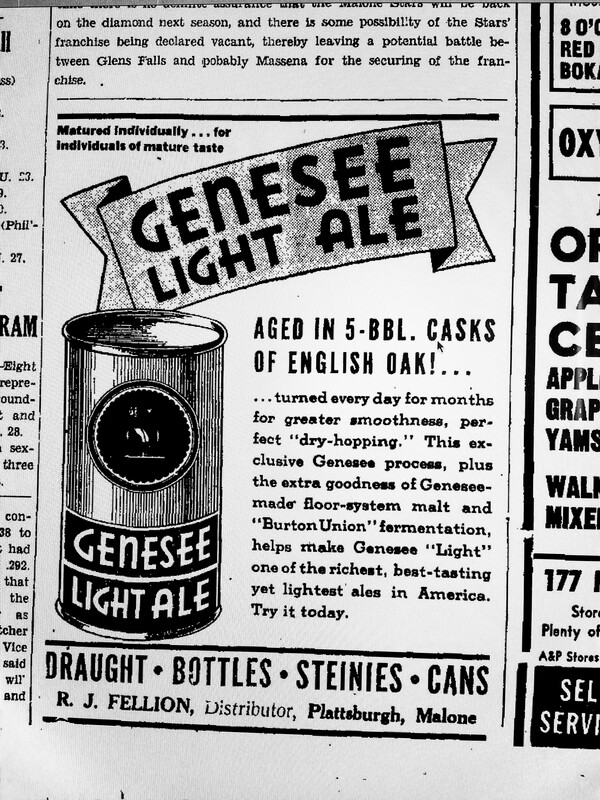 But Genesee’s ales were clearly quite different in 1938, or at least this specific brand, Genesee Light Ale was. In effect it was an IPA, akin to Ballantine India Pale Ale and other IPAs that continued into the 1950s in America. By 1977 when the American brewing renaissance was born, only Ballantine’s was left standing. But it lasted long enough to influence the new ales and, finally, the IPA of today. N.B. America had a lot of white oak in the late 1930s, as today. Yet Louis Wehle insisted on importing British oak vessels to dry hop and mature his beer after cleansing in the Union set. The reason is known to beer historians: at the time it was felt pale ale could not be successfully made using American oak in any part of the processing. Its tannins imparted particular flavours, vanilla- and coconut-like, that were felt to spoil the taste of British and Irish ale. All beer fans know those tastes from the barrel-aged beers of today. Times change. Note re images: the original advertisements may be viewed in this group of newspapers from the NYS Historic newspaper archive as stated in the text. All intellectual property therein belongs solely to the lawful owners, as applicable. Images used for educational and historic purposes. All feedback welcomed.